Quod Libet has different ways to browse your library, called Browsers, which are selectable from the View menu. There is always one (the primary) browser active. You can also browse your library in a separate window (without disturbing your current playlist) by selecting one of the options from Browse → Open Browser. You can have multiple of these open at once, and they will all react to changes to your library underneath. The Song List, as the name implies, presents a list of all the songs that the current browser has found, or filtered for you. The columns are configurable, and can generally be any tag, or even combinations of tags from your library. For more information on tags, see An Introduction to Tags. song list, typically based on a tag. Some filters are not available on all browsers. For example, the Search Bar can filter by anything, but there’s no way to get a “top 40” in the Album List. Note also that when using the song context menu (a.k.a. 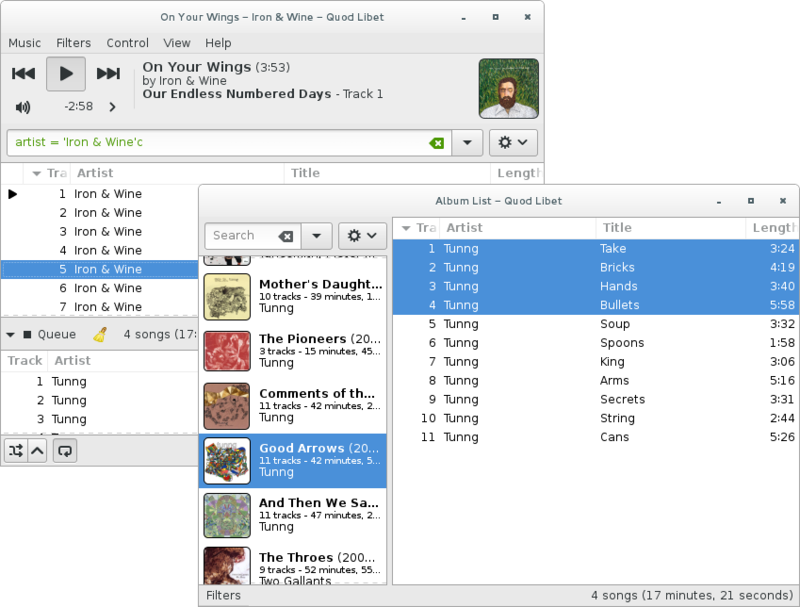 “songsmenu”), QL notices which column the mouse is in when you right-click on a song selection, and will offer this column as a quick filter too, if possible.